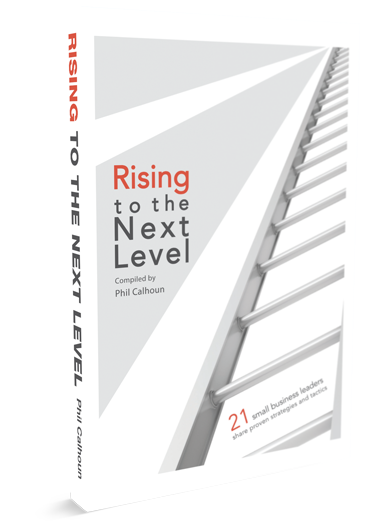 Rising to the Next Level: a new book for small business owners that I contributed to! 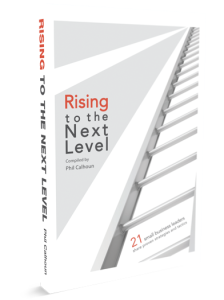 I am proud to say that I am a newly minted contributing author to a book called “Rising to the Next Level: 21 small business leaders share proven strategies and tactics”. It’s been a long labor of love by a fellow Orange County business owner, Phil Calhoun of Beta Benefits. Phil has been a very active businessman for many, many years in Orange County and an active member of the Santa Ana Chamber of Commerce so it was a true honor when he told me about this project he was putting together and what he hoped to accomplish with it. Phil has gathered quite a Rolodex (you younger people can Google that one) in his years in business and also talked to a great number of new entrepreneurs and even experienced business owners who had real questions or serious issues that they were facing in business and they needed concrete answers. Phil’s solution was to bring together all of the various industry experts that he knew and apply them to the knottiest issues facing their respective industries. The end result is this book, a compendium of “best practices”, pitfalls to avoid, proven strategies and useful tactics to navigating the challenges of running a small business in today’s marketplace. I’m not going to spill the beans by saying that my portion has to do with the Internet and how to properly think about your web site. You will, however, have to buy the book to get the details. Handily, I’ve supplied a link so that you can do just that on Amazon, here it is! I wanted to close this article out by personally thanking Phil for his invitation. Phil is the kind of guy who, by his words and deeds, inspires a great deal of confidence. Thank you, Phil, for the chance to work with you and all of the other authors on this great project. May it be the first of many for you!